Wash and dry apples; remove stem and blossom ends. Insert wooden stick into stem end of each apple. In medium microwavable bowl, microwave candy melts uncovered on High 45 seconds or until melted; stir until smooth. Dip each apple in melted coating, turning and spreading to coat. Let stand on waxed paper until firm. 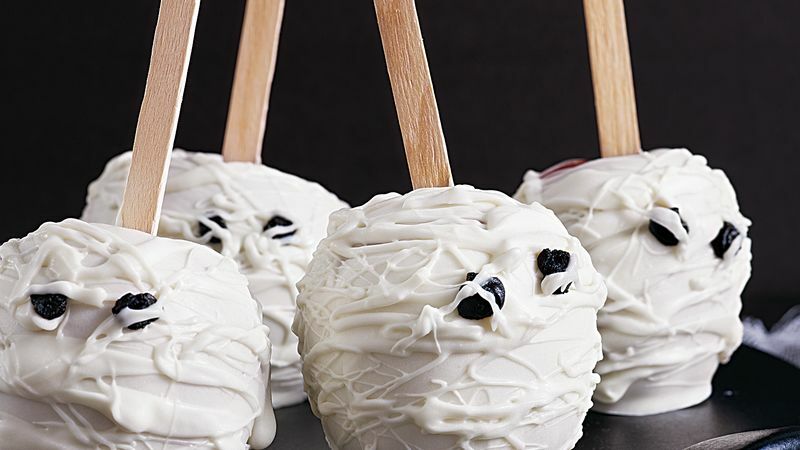 With fork, drizzle remaining melted coating (reheat if necessary) across coated apples in zigzag fashion to look like mummies. With black paste icing, pipe eyes on each apple. Let stand until set. Use orange candy melts to make pumpkin heads. Follow the same procedure, painting pumpkin faces with black icing.